Looking for wedding favours to remember? 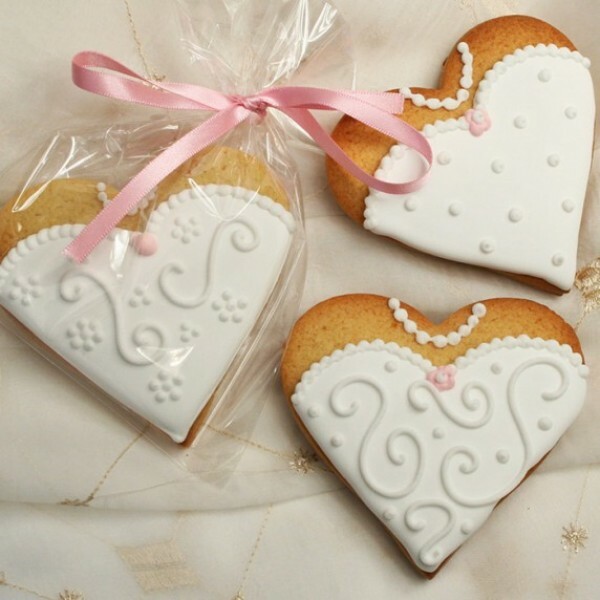 Your guests will love these heart-shaped cookie favours decorated in the style of a wedding dress. They can be customised with your choice of cookie flavour, accent colour and ribbon colour. Simply add the details at the checkout! Chocolate Brownie - cakey texture, rich chocolately taste. b) Real vanilla (made with Bourbon Vanilla Extract) - semi soft with the flavour of natural Vanilla c) Ginger - soft & cakey with a ginger kick. Gift orders are generally a mixture of all 3 flavours (unless otherwise specified or unless the order is a single cookie) Wedding or event cookies are made in your choice of flavour or flavours. Cookies contain Wheat (Gluten), Milk, and Egg Cookies do not contain nuts but our cookies are be made in a bakery that also handles nuts and soya. As all our cookies are made & decorated to order, we will usually require 1-2 days to prepare your order (and prefer 1 weeks notice for orders over 50 cookies and 2 weeks notice for orders of 750 or more). If your request is more urgent please contact us and we'll try to accommodate where possible. Rest assured all our cookies are extremely well packaged and breakage is very unlikely. However, for larger orders (in particular functions & wedding favour cookies) we’ll include some extras free of charge just to put your mind at rest. Custom Cookie Company can despatch orders everyday except Sundays. Unfortunately Custom Cookie Company cannot guarantee that delivery instructions provided to us will be carried out and are not liable for any errors made by Royal Mail or courier companies and can't be held liable for delays in delivery or lost or damaged parcels. As all our cookies are made & decorated to order, we will usually require 1-2 days to prepare your order (and prefer 1 weeks notice for orders over 50 cookies and 2 weeks notice for orders of 750 or more). If your request is more urgent please contact us and we'll try to accommodate where possible.